Following the loss of my lovely little feline, my guy and I quickly began spying my beloved grandparents’ (long passed) cardinals everywhere…. Not a completely rare phenomenon in our region, but definitely not common — and not to the degree that we were witnessing. In the orchid tree outside our window, on the hike we took the following day, on the way to the car — literally everywhere. Immediately after the cardinals, the blue jays appeared. When one came to peacefully rest beside me in the wetlands, I had to honor these bright beauties. For those who believe in the concept of animal totems and symbolism, internationally recognized teacher and author Ted Andrews is a wonderful resource. His 1996 book Animal-Speak: The Spiritual & Magical Powers of Creatures Great & Small, and his later works Animal-Wise: The Spirit Language and Signs of Nature and Nature-Speak: Signs, Omens and Messages in Nature are always nearby on my shelf. Andrews worked in wildlife rescue and rehabilitation, and participated in animal education and storytelling programs in school classrooms. He was specially invited to speak to the UNSRC at the United Nations in New York for his writings and work with animals. 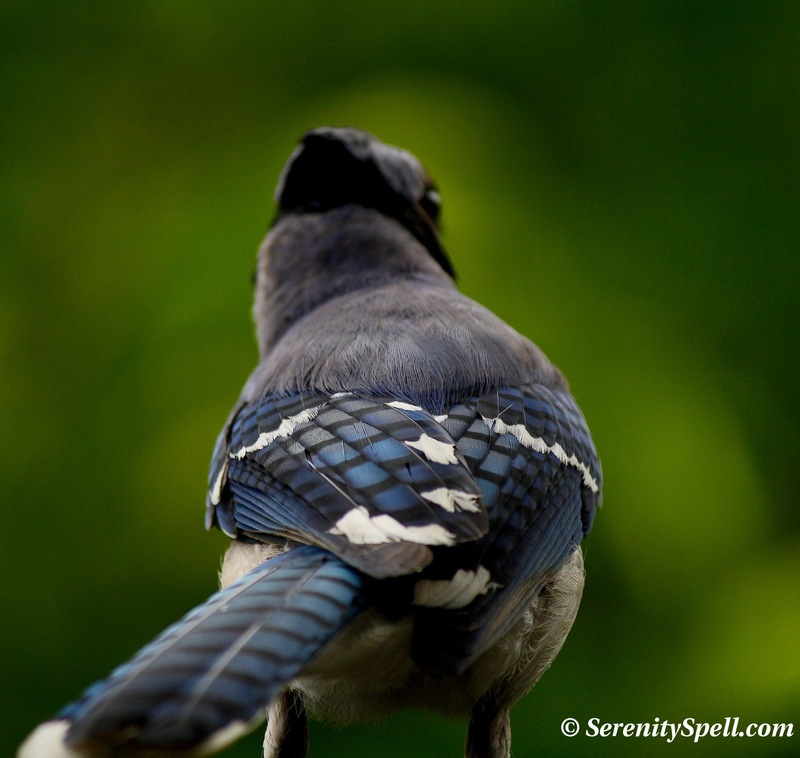 Yes, Blue Jays are common…. They’re noisy members of the crow family Corvidae. But as such, they’re intelligent birds with complex social systems. Besides having countless whistles and calls of their own, they can imitate the sounds of many birds — particularly enjoying those of hawks and owls. They seem to derive much pleasure in their cacophony of noisy calls and songs. These North American jays are known for their aggressive behaviors and mischievous activities (especially at feeding stations) — as well as for occasionally destroying the nests and eggs of other birds — but our Florida Blue Jays are far from aggressive. They’re actually the bullied and shy birds at the birdfeeder — chased by the grackles, and even by the doves…. And chased from nest to nest. Their curiously shy behavior has been observed by many in the area. Why are South Florida Blue Jays so seemingly timid? Blue Jays search for any suitable tree or large bush to build a nest, in which 4-5 eggs are laid and incubated by the female over 16-18 days. Both the male and the female build the nest and rear the young. Blue Jays are monogamous, maintaining the bond until one dies. 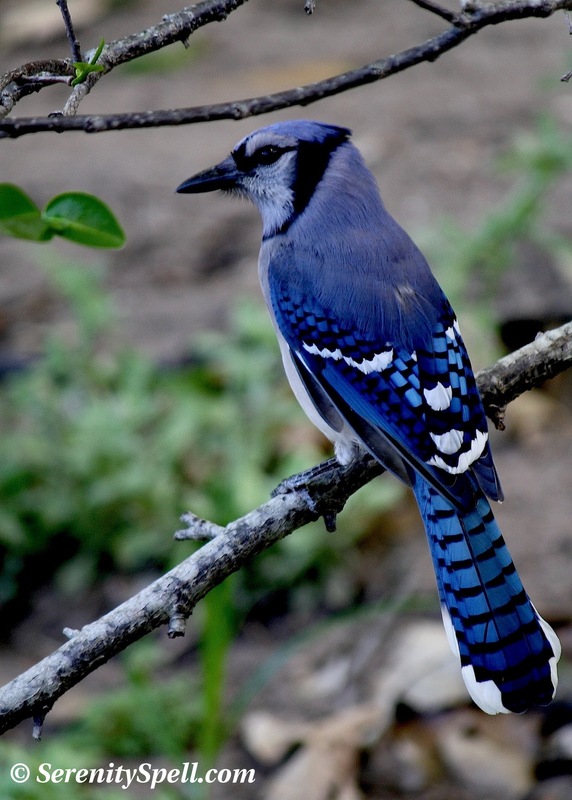 Another interesting note: As with other blue-hued birds, the Blue Jay’s coloration isn’t derived by pigments — it’s instead the result of light refraction due to the internal structure of the feathers, also known as structural coloration. If you crush a Blue Jay feather, the blue will disappear. They’re particularly fond of peanuts and sunflower seeds. However, a note from Avianweb on feeding peanuts: Peanuts are a valuable source of protein – however, peanuts are often contaminated with aflatoxin, a fungal toxin. Aflatoxin is carcinogenic and causes liver damage in birds and other animals. Roasting reduces aflatoxin but does not eliminate it entirely. North American peanut producers are currently working on eliminating contaminated peanuts from their products. Caution is advised when feeding peanuts. I’ve never known blue jays to be meek, so the ones in your area come as a surprise. I was also surprised to learn that the blue coloring of jays isn’t from pigment, though I’d read about that phenomenon in other animal species. Thanks for the information. She has beautiful feathers! You captured her so well! That’s exactly the sort of thing I do! 🙂 I can’t tell you how many feathers I’ve collected… I’ve now taken to making things out of some of them, so they’re simply not sitting in a pile of floating about the place! I have clear shoe boxes full of all sorts of nature goodies, ranging from feathers to shells to rocks to just about anything outside. Family calls it my “Nature Room” or Museum! What perfect captures of these wee beauties. I love Bluejays!! There are a number of them that nest on our property,…. along with a large and varied community of other birdies…. That first picture is unreal… world class 🙂 Your work is amazing. Thanks so much, you’re exceptionally kind! I was VERY lucky to have her visit me so closely — within inches! ♥ She’s a little beauty. Thanks for the links to Ted’s books. I’ve found that bird feathers “speak” to me. 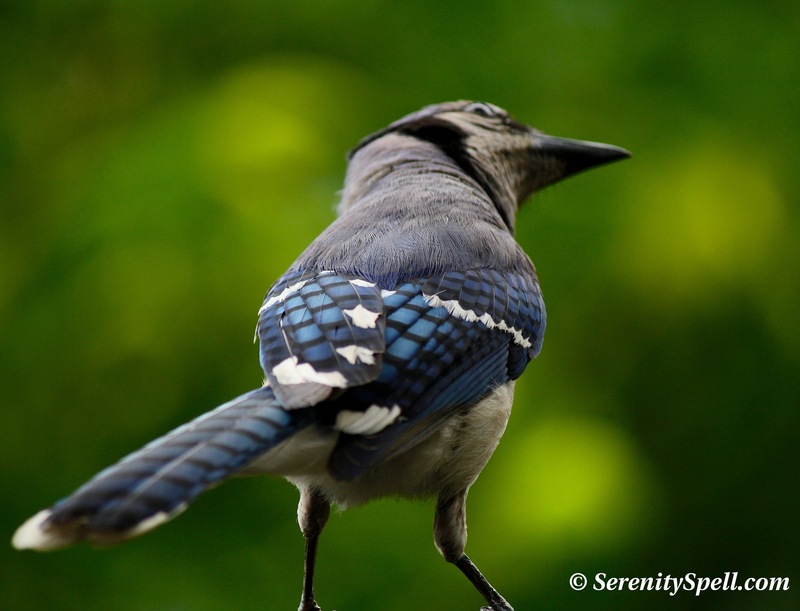 This is a beautiful reminder for me – having lived a good portion of my life in the northeast – the blue jay, clever and pesty, are quite entertaining. I love the crests of this and “my” Stellar’s Jay. Absolutely — you’ll love his books! I’m with you on the feathers (as are so many other nature-types! )… They’re all over my place, and a blue jay feather is right in front of me at my desk. 🙂 I actually started making smudge sticks with crystals, because I had gathered so many found feathers. Absolutely, I can send you a feather if I find another — specifically a jay feather? What beautiful photos of the Jay! You were clearly blessed to get that opportunity! Thanks so much! I was truly VERY lucky to have her visit with me so closely — within inches! ♥ She’s such a little beauty. I think blue jays are so pretty. 🙂 I get to see some on my walk once in awhile. These are wonderful and just incredibly beautiful photos. Well done! Blue Jays are plentiful at my house and love it when I leave peanuts out for them. 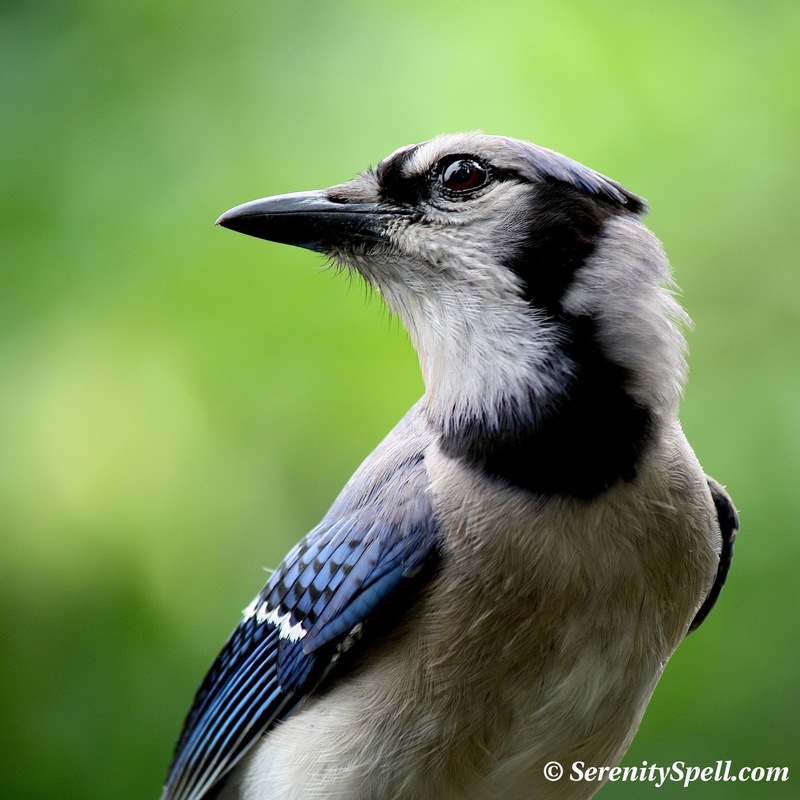 I love when the jays visit; just this morning, I had a few baby jays at our feeder — adorable!! I didn’t know they were related to the crow. I guess they are related to the raven as well, of which we have many. They can speak up a storm, too. Blue jays are everywhere in Texas and they used to swoop down on my cat and even passing cars. Neat photos, Fey. What length lens do you need to really do effective bird photography? I think I asked you that once but forgot. Thanks much! I adore our jays… They’re *so much* more timid than those in other areas, it’s very odd. They get bullied, chased — so I always feed them on the sidelines (I have baby jays in the yard). Right now I’m using a 55-250, but I need a bit more — usually I go on hikes, which require more telephoto. In this case, she landed right next to me — literally within inches. I had to back up to catch the shot. 🙂 But I’ve been watching Nick’s purchase closely — I was playing with getting a new lens, then a new body. Then… which one?? I had been leaning towards his purchase, a 7D. Perhaps, soon, soon…! I’m awestruck by these beautiful images. Immediately I thought, I have to have a copy. Then I considered it my responsibility to get out there and capture my own experience. Excuse me if you have the information posted elsewhere, but will you share your background in photography, the camera used, etc.? I will explore your website for more information, but I don’t want my tendency of getting lost on the computer to keep me indoors. Thanks so much for the pictures. Thanks so very much for your exceptionally KIND comments — it truly is an utmost compliment! I apologize for the lack of photography information — I definitely need to update my About page! I’ve recently moved from a Canon Rebel to a Canon 7D, although you haven’t seen any of these images, yet. I don’t Photoshop the images — my desire is to portray them *exactly* as I witnessed them in their natural state, beautiful and magical as they are.